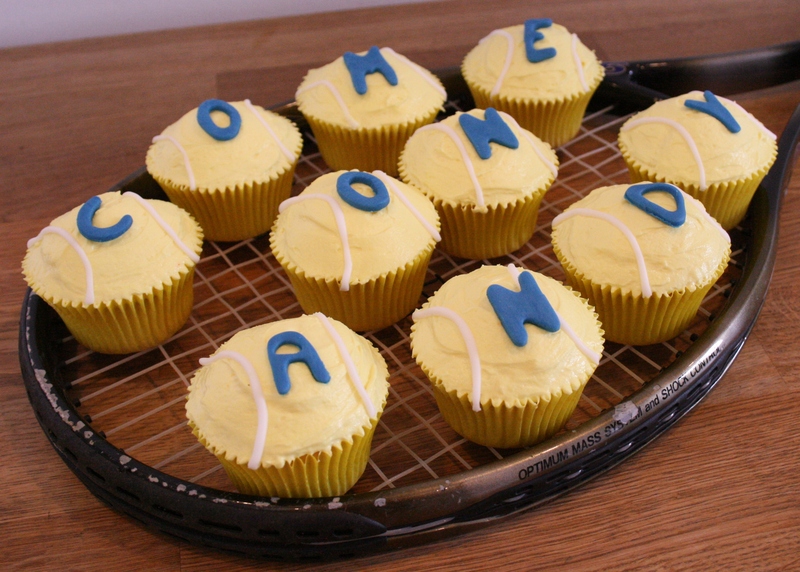 This really is just a show of support for the first Brit in a Wimbledon final for 76 years. I’m sure the yellow was closer to tennis ball colour in real life, I don’t seem to be able to tweak the colour adjustment appropriately, but maybe we dislike luminous food even more than blue so perhaps that is just as well. 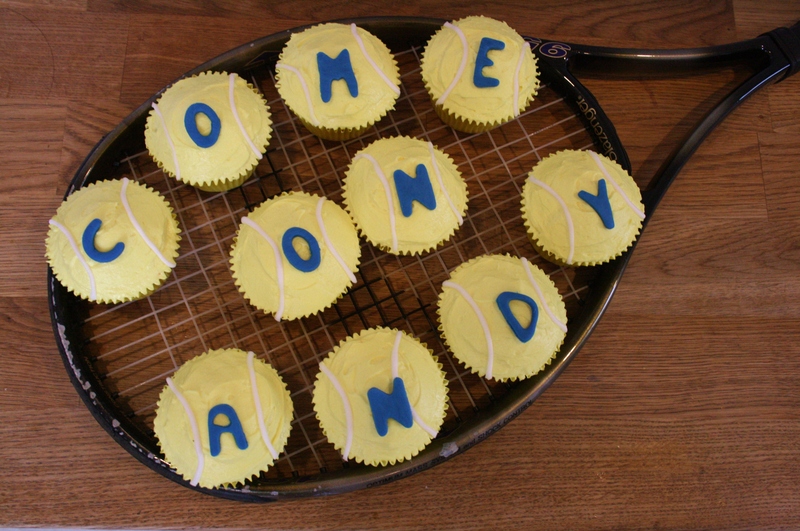 Anyway, Good Luck Andy, we’re rooting for you in this house. Vanilla cupcakes with strawberry flavoured butttercream. Update: Murray won. And just for completeness on this sporting day; Italy are currently 2-0 up against Germany. Viva Italia!! Further Update: Victory for Italy – I don’t think anyone was expecting that. As I was shopping with my BFF recently we wandered past a bakery selling the most amazing looking meringues. This most delicious looking batch of them was piled haphazardly and invitingly in the window. They were vast and in this case pink and so a germ of an idea started to form in my mind…. Wimbledon is in full swing and despite some improved performances from the British women, our main hope is Andy Murray as usual. As he is, in fact, Scottish I have developed the following based partly on Cranachan (an extremely yummy Scottish dessert) and Eton Mess. Preheat the oven to 140°C/Fan 120°C. Line a baking sheet or two with greaseproof paper. Into a clean grease free bowl place the egg whites and whisk at a fairly high-speed until the egg whites reach the soft peaked stage (as you drag the whisk out of the foamy whites, peaks form, the tops of which flop over). Add a tbsp of the caster sugar and whisk that in well, again on a fairly high-speed. Add another tbsp of sugar and whisk well again. Continue until all the sugar is used up. You should have a lovely glossy stiff foam. Add a small amount of food colouring and fold in until spread evenly throughout the mixture. Obviously colour to your satisfaction. Spoon heaped teaspoonfuls of mixture onto the baking sheets leaving plenty of space in between each dollop and transfer to the oven. This quantity should provide 12 meringues. Immediately turn the temperature down to 120°C/Fan 100°C. Bake for 1 hour. Then turn the oven off and leave the door ajar until the meringues are cold. They keep in an airtight tin for a week or two if you can resist them. 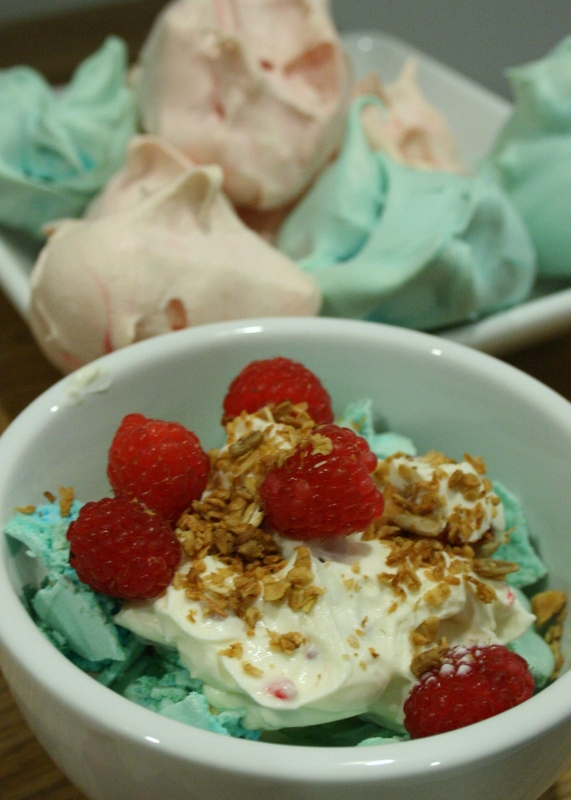 The Patriotic Mess: as you can see I decided to make both blue and pink meringues, but as far as the dessert went, I used the blue. Blue food as I have stated before is not very popular, however in this Olympic/Jubilee year there is a lot more blue food around. The blue is there, of course, due to the presence of the Scottish flag in the Union Jack, so this dessert is dedicated to Mr Murray and the match he’s playing this afternoon. I think it goes without saying that you can colour the meringues to your own tastes or not at all. You will need for 4 servings: 150 ml Double Cream and 150g or ml of 0% Fat Greek Yoghurt, 4 Blue Meringues, 400g Raspberries, washed, 2 tbsp Whisky, 2 tbsp runny Honey, a sprinkling of toasted Porridge Oats or Granola! In a bowl whip the double cream until stiff (use a balloon whisk). Fold the yoghurt, whisky and honey into the cream. Fold in the raspberries. Dollop single spoonfuls of the raspberry cream mixture into the serving bowls, crumble over the meringue, add another spoonful of the cream mixture and top with the toasted porridge oats or granola. Meringues Part 2 involves the chocolate cake I promised….